Can you explain the difference between the four red lines? The limits come from ATLAS searches in three different channels: llqq (weakest, ATLAS-CONF-2015-071), lvqq (2nd weakest, ATLAS-CONF-2015-075), vvqq (2nd strongest, ATLAS-CONF-2015-068), and from the CMS search who combined different channels (strongest, CMS-PAS-EXO-15-002). If you compare the exclusion limits presented in arXiv-1512.03371 with the ones presented by ATLAS and CMS in Run-2, you will see that the Run-2 first results can not exclude the combined Run-1 excess (but do disfavour the ATLAS hadronic result from Run-1). That's exactly what I did in the plot (best fit from 1512.03371 rather than exclusion limits), and the conclusion is different. My estimate is that the significance is reduced to ~1 sigma (not sure how you get sigma13 = 1 ± 13 fb, im getting something like sigma13 = -7 ± 8 fb since most of the 13 TeV searches mentioned above have deficit). In any case, if this was a real thing one would expect the significance to grow after doubling the dataset, instead of being reduced. what d you think jester of the proposal in http://syymmetries.blogspot.com.au, to organize sort of a website/blog/... where all the different explanations of a given anomaly, lets say diphoton or B-decays, can be discussed in a organized way. ¿? maybe something along the lines of 1512.04357 but on the web. I'm a bit skeptical this may work on internet. 1512.04357 started with a critical mass of people meeting in one workshop, and it was clear how the credit is to be assigned (individual papers first, then a common arxiv document, LH proceedings in the future). I'm not sure if this kind of structure can be reproduced without a central hierarchy, but I will follow this experiment with interest. Sorry to bother you with a question from the clueless commons, but the disappearance of the signal at higher energy provides a natural segue; how did particle physicists figure out that a signal going away at higher collision energies meant that it wasn't real at the lower energies? Because at higher energies you are supposed to see everything you see at lower energies, even more "brightly", and then also the new stuff that appears only at higher energies. If you fail to see something that you thought you saw at lower energies, it's because it wasn't there to begin with, and low-sample statistics has been playing tricks on you. "Because at higher energies you are supposed to see everything you see at lower energies, even more "brightly", and then also the new stuff that appears only at higher energies." That's what I want to understand; how was that determined? Jester - the 1 +/- 13 fb comes from Table 2 in 1512.07225. I'm not sure where that number comes from (nor your much less significant number). While one does expect the signal to increase with more data, it is always possible that the Run I data fluctuated up and the Run II data fluctuated down. We'll know for sure by summer. It is not a priori true that higher collision energy in a hadron collider will give you a better "view" of your signal of choice. One always has to take into account the so-called background processes, which give you final states which are the same as or will be indistinguishable from the signal you are looking for. If these background processes become much stronger to a greater extent than your signal at larger collision energy, you are worse off at a high energy collider. However, the production of very heavy multi-TeV particles that could explain such an excess (in this plot a new 1.9 TeV boson) is a typical example where going from 4 TeV proton energy to 6.5 TeV proton energy gives you a sizable increase in signal rate, and so these processes tend to profit from a higher energy LHC. In this case, to such an extent that, as Jester says, the 13 TeV data have comparable power to the 7+8 TeV data despite there being much less integrated luminosity available. Jester, you said " I'm getting a similar result if I omit these two, while naively combining the CMS and 3 ATLAS searches I'm getting sigma13 = -3 ± 10 fb (the number I quoted in an earlier comment had a bug). In any case, we agree the significance drops a little below 2 sigma after the 13 TeV data are taken in account". But is sigma13 is 7-8 times as big as sigma8, then sigma8 would have to be (with sigma13 < 7 fb) less than 1 fb. That seems like no significant signal at all. Or did you scale sigma13 to be the same as sigma8? 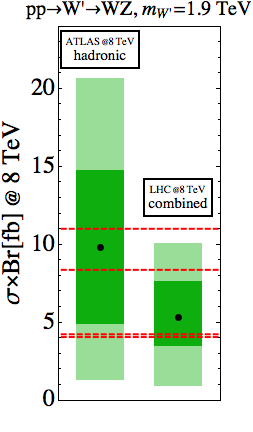 Sigma13 quoted above is not scaled (the corresponding cross section scaled down to LHC 8 TeV is 6 times smaller). There is a clear tension between the run-2 and run-1 diboson data at 2 TeV. Both datasets have a similar statistical power after scaling the cross sections to a common reference. So when you combine the 3 sigma excess in run-1 with the half-a-sigma deficit in run-2 there remains a bit of an excess: 1.7 sigma according to my calculation, and 1.9 sigma according to 1512.07225. My interpretation is that this residual excess is not interesting at all. If the W± bosons both have heavy W' cousins, then how likely is it that the Z boson has a heavy Z' cousin? not criticizing the general message in 1601.03153 of background modeling being important - however I don't understand the use of the BIC in this context. BIC is an approximation to the Bayes-Factor - but I can hardly imagine anyone being able to properly define a BF in this context (BF + having no or very weak prior knowledge is a can of worms) -> BIC is meaningless here. Also their background only fit seems to be over-predicting for >800 GeV. In the end this is a non-trivial model selection problem. It all boils down to how much ATLAS is able to simulate backgrounds. Is it really true that ATLAS decided for a1=0 after seeing the data? I'd imagine this was justified from their own MC studies? @anon the BIC is an approximation in special cases to -2 log Bayesian evidence, not a Bayes-factor. A Bayesian evidence (and indeed a Bayes-factor) is independent of priors for models (but is a functional of prior densities for parameters in models). I agree that the use of BIC is strange, however, as it's a combination of Bayesian model selection for the background shape followed by strictly frequentist hypothesis testing of the background only model (with a LLR test-statistic). Obviously getting the background predictions/uncertainties is important, and I'd be astounded if ATLAS had made such a trivial error as using an unduly restrictive functional form for the background shape. If they have, it's a major embaressment ranking alongside FTL neutrinos, especially given the 150 hep-ph papers. by prior knowledge I was referring to priors on model parameters, which the BF as ratio of the marginal densities is highly sensitive to (not priors on models themselves). I agree with the rest.